You know those annoying people who glamorize past and constantly reminisce about how great their childhood was? Well, I’m one of them, and out of all things, I mostly miss how prolific the old times were. Every year Woody Allen would release a new movie, Prince - an album and Stephen King - a book, remember? Nowadays, anything is rarely that reliable, but, to serve our clients better and keep the great tradition of regular updates alive, Cart2Cart tries to expand migration opportunities of its customers regularly. Therefore, recently we’ve added 71st platform to our supported carts list - from now, automated migrations from ekmPowershop are a matter of few hours. EKM is a popular, UK-based, hosted solution with a grand market experience (platform’s been around since 2002) and today we’ll get you to know it a little closer, its features, pricing policies and reputation. ekmPowershop is a home to 30,000+ online shops, and has generated over 5 million pounds in sales worldwide. That’s impressive. Platform provides a reliable hosting - guarantees 99.9% uptime and 24/7 server monitoring. Therefore, if you’re an e-Commerce hypochondriac - laying awake every night and psychotically listing each little issue that might pop up and ruin your business - EKM will bring you peace. Each hosting problem that occurs, if it does, gets resolved within minutes by cart’s technicians. EKM is fairly advanced when it comes to looks. It offers 150+ classy themes - all easily customizable via simple drag and drop editor. You’ll be able to adjust design appropriately for the business niche you’re in instead of settling for a generic e-Commerce website. Plus - ekmPowershop is automatically updated every so often, which opens its clients to the latest design trends. EKM’s marketing tools won’t let you down too. 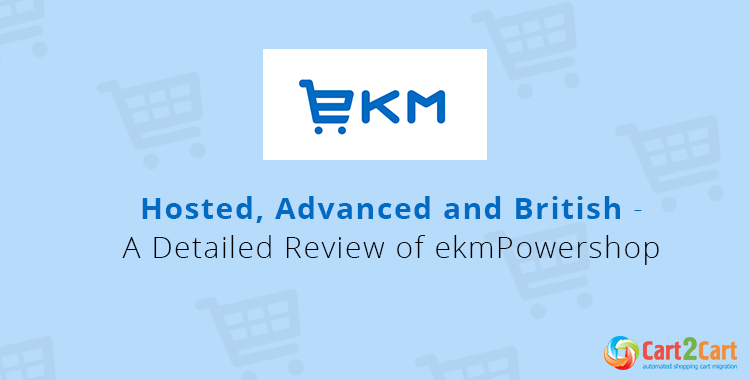 Comprehensive SEO options, special email marketing feature, and having each of your products added to Google shopping (world’s largest shopping directory) - that’s what's you get as ekmPowershop user. Additionaly, you can create a WordPress blog to get more traffic and loyalty program - to make shoppers return. There is also EKM’s social media integration - possibility to link Facebook, Twitter, Plus Google and other networks to your store to get even more exposure. 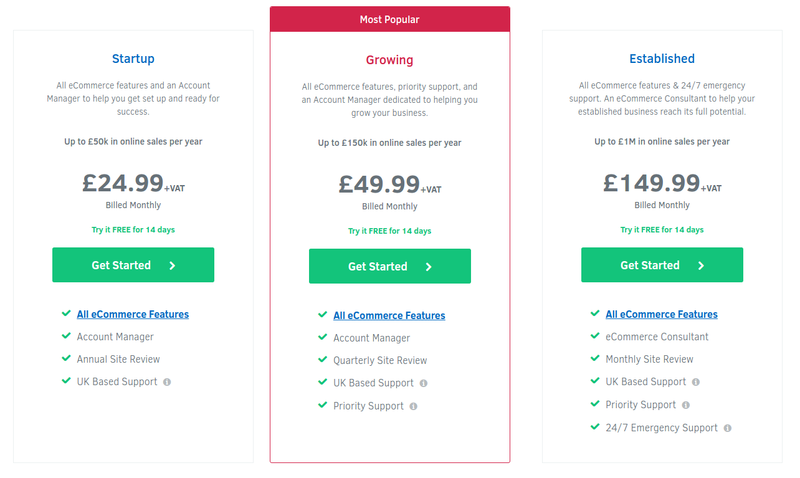 Cart’s pricing policy includes three plans - Startup (£24.99), Growing (£49.99) and Established (£149.99). You can test each of them for free - for 14 days with all the vital features at your disposal - visitors reporting and SSL certificate. However, there is peculiarity - EKM’s trials are actually demos and all the results of your work during them will be erased once you switch to an actual plan. The main difference between the plans lies in the degree of assistance they entitle you to. For example, Startup plan only provides the UK based Support - ability to call, email or chat EKM for UK residents. Growing also gives you a Priority Support - a chance to get the tickets answered within two hours, from any country. Finally, with Established you get a personal 24/7 emergency phone line, on top of the support from both previous plans. Cart’s independence is a two-edged sword: it takes the pressure off you, concerning hosting and security, but it also leaves you with no say in carts functionality. If EKM decides to implement modifications clients have to just live with them, and some complain that updates often disable their shops functionality. Also, ekmPowershop is UK based and UK oriented - if you’re from a different country or continent - you can’t get support of any kind on Startup plan. Although ekmPowershop’s managed to exist 14 years below our radar, now, automatic migrations from it are easily accessible. So, if your business needs are exceeding EKMs basic functionality - switch to 70+ progressive e-Commerce solutions in a few steps. Stop hesitating, and try a free demo right now.